Like most blogs this blog has frequent topics or categories. One of my favorite categories is Heirlooms. The things I am calling heirlooms are really just family keepsakes and have little or no value to anyone outside of my family. Nevertheless some of my heirlooms are coveted by several members of the family. Unfortunately that is not the case for today’s heirloom. Today’s heirloom is in search of a home. When I was ten years old (1969) my father, Kenneth Warford, was an Air Force chaplain stationed in South Vietnam. During the year he was overseas he sent me a number of souvenirs. Most have been lost or simply fallen apart in the years since the war but my most cherish souvenir from Vietnam survives. It is difficult to explain the bond I have with this particular heirloom. The close bond I have with this heirloom probably developed from the fact that it has always been in my room. For some reason, all of the women in my life, beginning with my mother, have encouraged my relationship with this heirloom. They have insisted this heirloom be kept in a place where I alone can enjoy it. Consequently I have taken especially good care of this heirloom and hope to someday pass it along to some member of my family. I am looking for someone to leave Jake to when I am gone. They need to be willing to love and appreciate Jake as I have. He is after all the only heirloom that I have actually named. I am honored to introduce you to Jake. 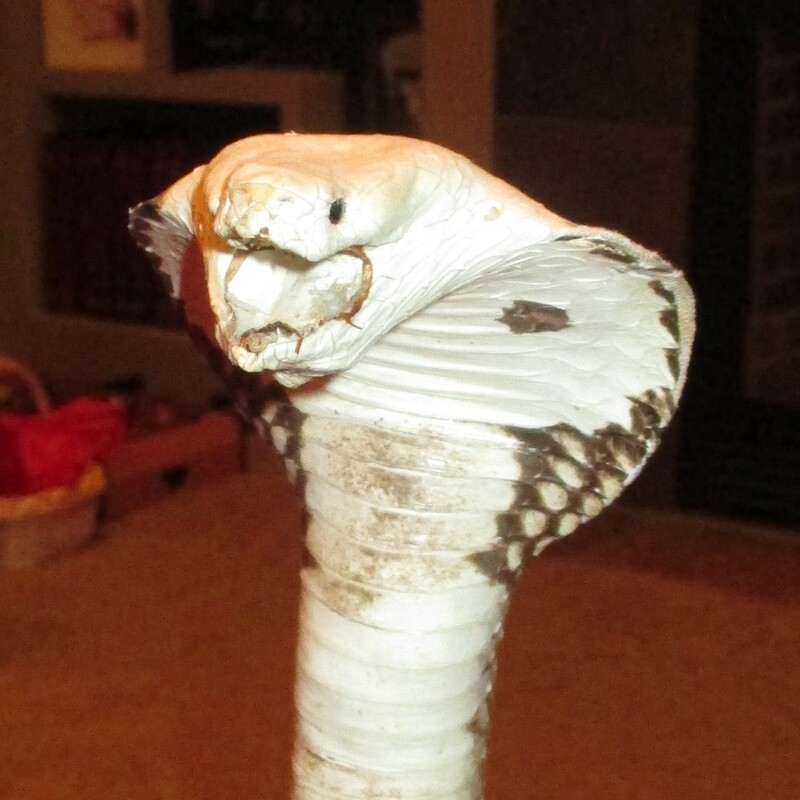 Jake is a cobra from Southeast Asia. Yes, at one time he was one of the most deadly creatures on earth but his venom glands were removed more than 40 years ago. He has not bitten anyone in the 40 plus years I have known him. As far as I know Jake is completely harmless accept maybe to people who have both ophidiophobia and a heart condition. 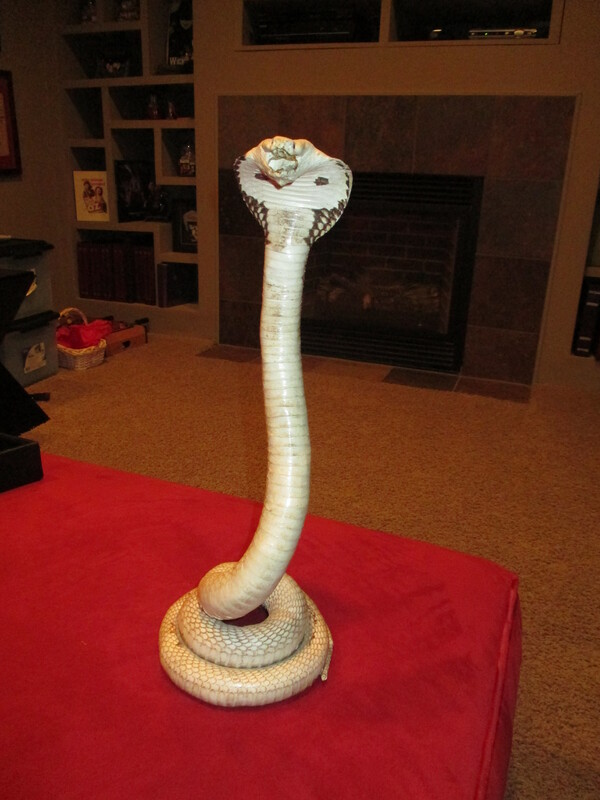 If you have an abnormal fear of snakes and a heart condition you might want to pass on Jake otherwise Jake is an heirloom in search of a home. If you are a member of my family even a very distant cousin and are willing to provide a loving home to Jake please contact me.